So normally I post recipes and only have the opinion of my local friends to go on if they taste good. They are the ones who get me delivering food to try before I post it so I know I won't steer you wrong. I don't know if that is the safest, as I do have nice friends and they may be biased to make me feel better. I doubt it, but just in case, I made this recipe for some of the most highly respected names in the Paleo Community as well as Best-Selling Cookbook Authors. So know this, before you make this that The Food Lover's Kitchen, The Fat Burning Man, Alyson Bridge, The Free-Range Human, and Pastured Kitchen all inhaled these when I made them. They couldn't see it, but I was doing a happy dance on the inside as it was the ultimate compliment. So go on and make great things, like this recipe with confidence that you will love it. So as most of you know if you read my emails or blog, I have had some significantly life changing events happen recently. Well today I signed on the dotted line to finalize my medical separation from the United States Marine Corps. I have sustained many injuries over the course of 12 years and they became too much to continue my service at my once highest caliber. This is both a scary and exciting time for me and I am ready to face the road ahead. It is crazy for me to think that my entire adult life I have been doing the same job all over the world, but the time has come for a change. That door closed but I will be opening many more and I appreciate all your love and support as always. This website will be my full time passion, so get ready to see even more of me. I look forward to only getting better for you. All I ask of you, is to just please keep visiting, sharing my photos and recipes and telling people about the amazing Banana Bread and Pulled Pork. You can substitute the bacon fat with duck fat, beef tallow, or any other fat of your choice. Made these today and they are nearly perfect! Next time I will use more ripe avocados. Any idea how many calories are in these? I made these for a friend’s birthday potluck bbq, and everyone loved them. They are quite tasty! This recipe. I can’t imagine life without it now. It’s perfect for parties, potlucks–even picky eaters like it! I was even able to make a tasty vegetarian version without the bacon and bacon fat (although it wasn’t as good as the version WITH bacon, of course!). And it’s SO EASY to boot! Thank you, thank you, thank you! 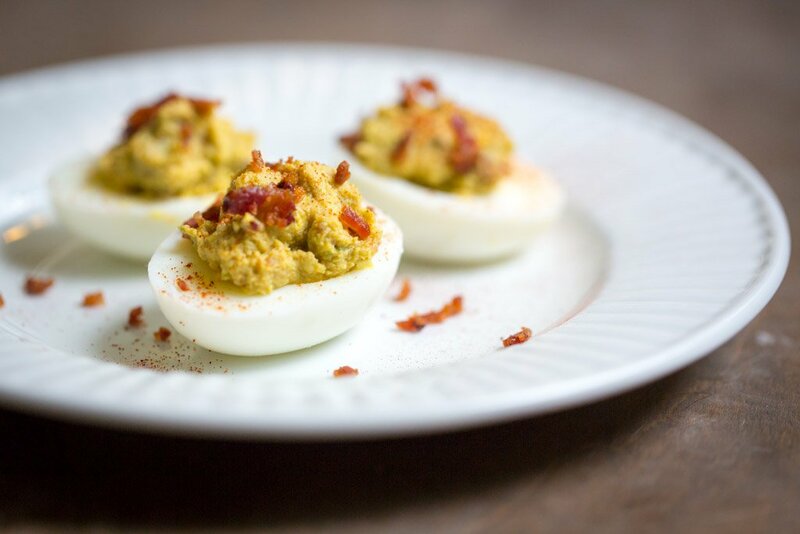 I first made these for my husband, because he hates traditional deviled eggs (the mustard, mostly) and LOVES bacon. I subbed 2 teaspoons of sriracha for the Frank’s. Once I tasted them, I made another batch for me! With far less hot sauce (I’m a spice wimp), but a little bit of mustard. Brilliant! I’ll definitely be bringing these to parties in the future. Thanks for sharing! PS – Bacon fat in the yolk mixture? Genius! WOW! You nailed it with this one! Just the right mix of spice, creaminess and sweet delicious BACON! Ps. I still make your pumpkin cookies religiously when it’s not even autumn. And I’m not ashamed. Thanks for your recipes and inspiration! This was horrible. Egg leaked out leaving pockets of air in the shell. They weren’t at all easy to peel. It was pretty well a waste. I wouldn’t recommend. You guys are too nice to save him some ;) I’m kidding. Happy you enjoyed the eggs!!! I agree. I followed the recipe exactly and it is crazy salty. I had a few others try and we were all in agreement that these were too salty to eat. I think the recipe could be good if reduced. I’d just go by taste next time. Yeah, we all have different palates. Definitely go by taste! These are a few of my favorite things…lala!! Thank you very much for sharing your recipes and for inspiring me to serve my family great WhOLE food!! Hrm, I’m considering making these for a potluck this weekend (you’re my secret weapon when it comes to potluck contributions), but I’m wondering how far ahead of time you can make these? Since avocados discolor so quickly, do you think the egg-yolk mixture would look brown and ugly if I made them a day ahead of time? Or is there not enough avocado for it to make a big difference? These are absolutely delicious!!!! I would probably omit the salt next time. A lil too saltywhen you eat half the batch. I think the bacon that I use(Costco) is salty enough. Well I was perusing paleo sites to find something to take to my family reunion this weekend. I’m the only Paleo-ite (??) in the family and everyone has to bring a dish to share. Naturally I wanted to bring something that I could eat (since there won’t be much there that I can) but that will also fool everyone else. Based on the drool on my chin, and all the rave reviews, I think I just found the winner! Thanks for everything you do! This Paleoite couldn’t survive without all of these amazing recipes! George, these are brilliant! The test run was a success. So delicious – and pretty darn easy too. Today is the second time I’ve made these and, once again, they did not disappoint! I didn’t have frank’s this time though so I used home made sriracha (nom nom paleo). I don’t know whether I prefer the franks but I’ve even on a bit of a sriracha binge lately. Thank you for coming up with yummy, healthy food for me and my family! Just made these for our BBQ tonight and they are amazing! The best deviled eggs I’ve made and I can’t wait to serve them up. First I have to keep my husband from eating them all! Thanks for the simple, creative and delicious recipes. These are fantastic! I made them for guests last week and they loved them. I’ll make them again — and often! GEORGE! These eggs! OMG. These might be the best thing I’ve ever made from your site…but IDK. There are just too many amazing recipes. I made them for a party and tripled the recipe. Needless to say, they were inhaled by all of my (non-paleo) guests. Thank you for all of your great recipes and keep doing what you are doing. You have great talent! I have been trying all morning to order the ebooks bundle…and it is saying “out of stock”…Help please! These look great. Can’t wait to try them this weekend. The secret to peeling eggs is after they are boiled, pour off some of the hot water and fill pan with ice cubes and let set for about 10-15 minutes. Then peel. The shells will not stick to the egg when you do this. A home-ec teacher in high school showed us this trick and I have been using it for years. AMAZING! Served these today, everyone LOVED them! These eggs will be a regular for bringing to things for sharing! Thank you! Oooh, bacon is such an obvious thing to add to deviled eggs, I don’t know why I never thought of that. Delish! OMG. I just made a double batch (with a little garlic and onion powder and a splash of vinegar) and they are almost gone. I doubt they will last the night. Thank you! So yummy! I love your recipes, thank you for sharing. I made the deviled eggs… yummy. The only thing I’ll change next time is the amount of salt. Probably use 1/4 teaspoon as they were so salty. I finally had time to make these last night, and I wanted you to know that they are making for fine breakfast this morning! YUM! Just made these with the free range eggs I got from the farm this morning and I gotta say they were eggcellent, thanks for the recipe! The wife suggested we add a little mustard next time to give it a little more zing. Let NomNom know that it’s definitely true, the fresh eggs were way harder to peel than the one old egg I used. You are a genius!!! I absolutely cannot stand the yolk of an egg, it makes me sick, until now!!! I made these last night and I ate all of them! They are absolutely amazing!!! This is the ONLY way I will eat an egg yolk! George you are a genius when it comes to creating recipes! These will be a staple at all holiday functions throughout the year!!! You are one of my 5 year old son’s personal heroes. You cook meat, and you’re a Marine. He has been declaring he’s going to grow up to be a Marine, since he was six months old. Good luck with the next phase of your life. Thank you for your years of service to our country as well as the commitment you have made to the paleo community. Your blog has been an inspiration for me on many a difficult day to stay the course to heal my broken body due to my lifelong poor eating habits, so thank you for making a difference in my life. Bacon has always been my favorite food and I can remember helping my grandparents butcher waiting for fresh uncured bacon to be cooked. Who knew that I loved pork belly before it became such a hot item. I love to make cabbage stuffed with bacon, cauliflower rice, tomatoes, and spices that are baked then fried in bacon fat right at the end. Also love bacon and pork rind coated fried green tomatoes. Bacon goes with everything!!! Oh made these eggs today and they were FANTASTIC!! I just made these with the last of the eggs from Resurrection Sunday. Other than they were inhaled by the hungry hoards, the favorite comment was, MOM! we have green eggs and ham. Yah, there are comedians in every crowd and they are all mine. Keep us posted on your new adventures. The lesson you are teaching my kids can not be replaced. Here’s to new beginnings! I have had many career changes! Great for learning! My favorite use of bacon is in bouef bourginon or any beef stew. Adds a great depth of flavour. Great to fry bacon first but not crispy and then brown the beef pieces in the bacon fat. Chop the bacon and add it to the stew pot (I use my crockpot) along with the browned beef. Add other ingredients. Going to make some now! Baconnaise is my favorite use for bacon grease, and bacon wrapped chicken thighs is a family favorite. I must say your bacon gauc eggs will be made tonight! Thank you for your service, and I hope the next 12 years will be equally fullfilling! I get chocolate chip waffles and spread them with curry peanut butter and add LOTS of bacon. It’s a wonderful savory/sweet sandwich! Great recipe! My favorite way to use bacon is Eat the fattiest bacon I can find & fry green tomatoes in the grease! Bacon in my chili is my fav way to use bacon, it gives a nice even savory flavor with a hint of smoke that sets of the taste! Eggs and bacon. Bacon in salads. Bacon wrapped around a spinach and feta stuffed chicken breast, bacon on top of a burger, bacon on top of jalapeño poppers, BLT just doubly wrapped in lettuce, 85% dark chocolate and bacon…….. Bacon is just fabulous on almost anything. Paleo dark chocolate barkwith bacon bits!! My favorite use for Bacon is to wrap dates with a half a slice and bake them. It’s like the best candy ever! Thanks for sharing the delicious recipe! It’s now an item on my Sunday meal this week. It’s so hard to choose just one recipe containing bacon because we eat it everyday in this household. I make my husbands breakfasts for the week and pre-portion it out into Tupperware. His request is that it ALWAYS has bacon in it. What left of his big scrambles are what my 1 year, my 17 year old foster son and I eat in the mornings. We usually have 2 or 3 Paleo salads with dinners a week too. Our foster son was leery about eating Paleo but now when we have cheat days he says he can’t wait to eat healthy the next day. He has even felt a difference in the way it makes him feel. So, thanks for sharing recipes like these (especially ones with our favorite…… Bacon!!!) so I can spice things up in the kitchen. I’d have to say if you are going to make me pick one favorite bacon dish it would have to be bacon or prosciutto wrapped asparagus. Yummy!!! I tried to think of something original, to catch your eye… like broiled bacon wrapped water chestnuts, with pineapple. But to me, the very best way to eat bacon is after you’ve made your bacon and eggs, pancakes, BLTAs, etcetera. That last slice of bacon, on the paper towel always tastes the best. My favorite use of bacon is wrapped around chicken! Delicious! Mmmm…. Bacon Cheddar cheeseburger….! My fav! OMG!!! These are fantastic!!! I’ve been looking for ways to use the eggs that my kids colored for Easter, but I just couldn’t find a deviled egg recipe that I was fond of. Whipped these babies up (after a 6.5 mile walk this morning), and had them along with a baked sweet potato and some roasted asparagus for breakfast. LOVE LOVE LOVE!!! My favorite use for bacon…..just eating it fried up stovetop style (baking it is good too). My kids have started devouring bacon. And my 5 1/2 year old said a few days ago that he could eat 100 pieces of bacon. I believe him!!! I make a bacon weave. Season with dry rub and bbq sauce. Pack the weave with sausage. Coat with more bbq sauce. Bake over coals for two hours. My favorite use of bacon? Bacon wrapped dates. THE most amazing dessert! …eating it. Eating it *so* hard! This recipe looks great. Can’t wait to try it. Bacon makes everything better, especially chicken. We love bacon avocado chicken. Good luck in your new career path, that is very exciting! Cook 1/2 pound sliced bacon (1 inch strips) until crisp. 1 small diced onion, 1 diced Green Bell pepper. salt, 1 tablespoon oregano and 2 tablespoons of Worcestershire sauce. I like bacon just straight up and crispy. Ah… Bacon goes on everything in my book! How about bacon covered bacon, Deep fried in bacon grease, wrapped in a bacon encrusted bacon sandwich, with a nice bacon salad? My favorite thing to do with bacon – cook it with garlic and kale! That’s how I taught myself to like kale. My favorite thing to do with bacon?…..Eat it! Would love to win! Favorite use for bacon: as a charcuterie facial? LOL! (I totally stole that from an episode of the Balanced Bites podcast, but I found it hysterically funny at the time.). Seriously, though, I love it crumbled on top of eggs baked in tomato cups. Although I’m sure this recipe will be my #1 favorite after I try it this weekend. Mmmmmmm. Bacon. I made deviled eggs for my husband and son all the time, but I’m going to try these next time. I was already considering replacing the mayo with avocado and seeing if they’d like them…add some bacon and what could be better? Of course I just like bacon right out of the oven…it’s better than chocolate! We had just boiled some eggs when I read your post, and so instead of making deviled eggs our usual way, we tried these instead. Got a thumbs up from all the kids and dh too! I love bacon in deviled eggs! I think I love it most on salads and in collard greens/kale! I made a batch of these this morning, using this recipe as the base and I also added a carmelized shallot and some roasted garlic cloves into the mix…SO good! Thank you for the recipe! I just wanted to write and say THANK YOU for your service. While I know many people that have served, I never have. Being a nurse, there was a time in history when I would not have been given a choice in the matter. For a while, I received several solicitations (for lack of a better word at the moment) from the army and navy. I have never had the desire to enlist – mostly because I’m chicken and didn’t want to be far from my family and friends. That and I have a temper, with a mouth to go with it at times – didn’t think that would work well in the military. So, after my babbling, I wanted to thank you for choosing to serve, so those of us that prefer not do can stay home and persue our dreams. I appreciate the sacrifices you make when choosing this. I appreciate your courage – something I’m in short supply of sometimes. So thank you, thank you, thank you. A big hand shake and hug sent your way. Does the avocado turn brown? I made these this morning and they were delicious! Thanks for the recipe! Mouth. Is. Watering. I cant wait to make these! I also wanted to saw congratulations on your new direction in life and I know you will meet the challenge head on! Now that you have all of this time to dedicate to the website, have you thought of doing a podcast? Ive heard your interviews on Fat Burning Man and Live Love Eat and I loved listening to both! Your story and passion are so inspirational that it motivated me to dedicate my energy toward self love and making my diet 100% paleo. Thank you for all that you do! Your words have touched me at the core. I am so proud of what you have done for this amazing country we are blessed to live in and so proud of the choice you have made. I’m sure it was not an easy one. From the bottom of my heart I thank you for your service. I am so excited to see what this next chapter in your life brings! Our little Paleo Bistro is a new chapter in my life (my baby turned six months old two days ago), and while change can be frightening, it’s also great way to start fresh. I wish you the best as you step through this new door in your life. Thanks for everything you do, and for all the great food ideas and health you bring to so many! I really hope to meet you some day face to face so that I can shake your hand. Now as for this new recipe…looks so good. I’ve been looking for a new and fresh way to make deviled eggs! YUM! Oh…and we just boiled eggs this morning, so we’ll be making these awesome looking eggs tonight! These look delicious. Can’t wait to try them this weekend. I wish you good luck with the next chapter of your life. I think it will be exciting and rewarding for you! And I’m being totally selfish here… But I think it will be great for all of us that visit your site, like reading your posts, and love your recipes. Thank you, George!! Scoop your egg mixture into the corner of a sandwich baggie. Cut the corner of the bag (think pastry bag) and squeeze out the filling into your eggs. I made your Banana Pumpkin Bread last weekend. It was so good, I couldn’t stop eating and forgot to take a picture for you. Best of luck in your new life and adventure! Good luck in your non military career and thank you for your service. You are a great asset to the paleo community. Keep up the good work. Wonderful recipe! Good luck in your life. I am old enough to have learned that you are likely to have more than one “new” life as you go along. I hope they are all good. Ohhhh!!! I’ve got to try your version with the hot sauce. I’m sure that gives it a nice kick. I recently posted bacon avocado deviled eggs but mine turned out more green. Lol.. And I’ve just shared your amazing Banana bread recipe. Seriously the best! Amazeballs. Now I need to get my hands on some pastured eggs and duck fat. Has anyone ever made deviled duck eggs??? Looks goooood! What could you use in place of the avocados, say if avocados are out of season?